In the Community of Rome we are spending Christmas with the Holy Father. On the 24th we went to Midnight Mass at the Vatican, when the Pope was attacked and knocked to the floor. Thank goodness he was able to get up on his own immediately and continue the celebration of the Mass. In the homily the Pope said that he was approaching Bethlehem like a "shepherd" to adore the Baby Jesus and he insisted on the need to remain awake and vigilant. 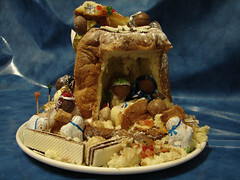 Corinne Manella, a member of the Home of the Mother who is studying in Rome, and Krisztina Orgona, who has come to spend Christmas here, prepared a very cute Nativity Set with a Pandodro Cake (very typical at Christmas in Italy), chocolate, nuts, and other food items. 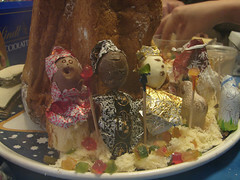 We have to admit that it no longer exists, in spite of the photos, because we've eaten it! Merry Christmas to everyone! We hope that you live this New Year very close to the heart of Baby Jesus..